The con was absolutely amazing! but the attendees were fantastic too. It was a lot of fun and I’d more than enough conversations with individuals asking about unique tech I’d not seen before that I wanted to work into future projects. Boozy Badger of Lawyers & Liquor was there and we’d more than one night of indulging in a ‘liquid diet’ to help facilitate the tasks we needed to perform. 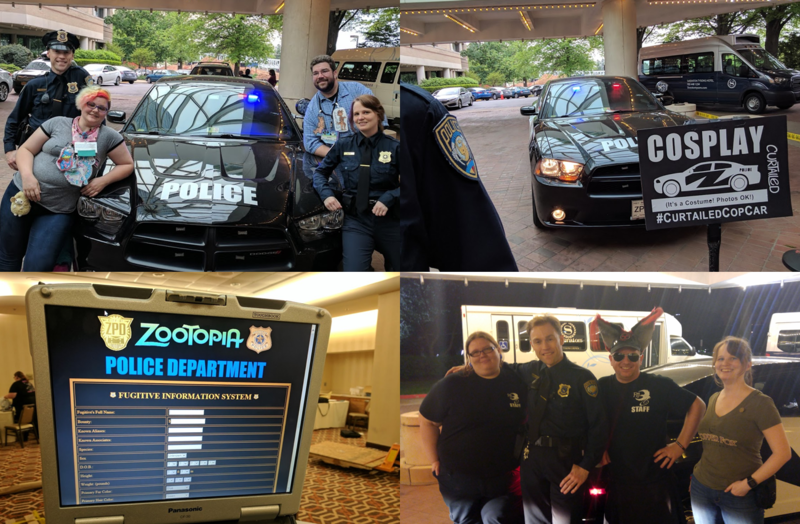 Some of those involved raising funds for the wildlife charity Frisky’s Wildlife & Primate Sanctuary which I’m very proud to have had the combined effort of Furthemore & Curtailed’s staff of ZPD officers raising $1700 USD to add to the incredible total of over $10,000!! If that wasn’t fun enough, we’d a ‘Most Wanted’ system worked up as part of the ‘ZPD Fugitive Information System’ in which we arrested those with the most donated to charity in their name, for an amazing tie between Shadow and Kiwiniwi, who were both ‘arrested’ and driven off in the #CurtailedCopCar during the Furthemore closing ceremonies. The next day we hung out with Latin Vixen and Rosco Racoon of Mixed Candy Costumes at the Udvar Hazy Air & Space museum before their plane left, geeking out over planes and discussing 3D printers and other tools we could use to make amazing new creations! I’m a wordsmith and I really can’t even begin to bring into words how much fun all this was and we hope to be able to do it again some time. The ‘Pursuit’ designation indicates it is a Charger variant produced by Chrysler that has a number of modifications made to it at the factory. There are many but the biggest are increases to durability and alternator, rims, suspension, brakes & pre-wired electrical. These modifications make the vehicle slower than a civilian version as it weighs more. This said, it still goes from zero to sixty in an even six seconds. The vehicle seen in the pictures above is not street-legal. It takes a few hours to put the vehicle into ‘theatrical’ mode, which includes mounting the lights and applying the vinyl ‘POLICE’ decals. These changes are reversed prior to taking the vehicle off private property. The local police captain was made aware of the above performance weeks in advance. The property owner must give us consent before we’ll consider doing this. Officers of multiple counties have driven right past, or parked near the cruiser while it had lights flashing without incident. They know the laws and are, at most, curious and amused. This vehicle has only ever had a single owner–myself. Fox Keegan. It came from the factory. To purchase a Pursuit vehicle from the factory you need a Chrysler Fleet account. To get a Chrysler Fleet account you must either own 15 Chrysler cars, or have bought 5 in the last year. I meet neither of the qualifications required to have a Chrysler fleet account. So when a man I’d just met online offered to let me make use of his I knew full well it isn’t permitted to be placed in another’s name as the original buyer. As such, I said, “Sure. Go ahead.” thinking it would make for a fun story. I thought he was bluffing, and called his bluff. I had not so much as driven one of these vehicles. This was not a planned purchase. I was in much deeper than I’d ever planned to be, but I hoped I’d like the car, because when someone offers to get you a brand-new cop muscle car straight from the factory that you aren’t supposed to be able to buy you buy the cop car. I like the car. It’s cooler than I am. all is an expensive trip for me from the UK, and most of my funds go into my motorcycle habit. Eh, maybe one day. Also i didn’t realize how much effort it took to buy the Charger. But i’m glad you did. Miles and 5000 hours on he engine.. also the other way to get one of these is if you are in law enforcement of a first responder/ fire fighter. If you have questions about hobbyist 3D printers, you can check http://www.thingiverse.com which has a bunch of specialized groups for answering questions and tons of people who have made awesome stuff. I browse it fairly regularly, as I have a few printers myself. 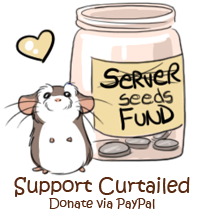 I also tend to check this comic every week, and often multiple times in a week (for some odd reason). Holy cow, dude… That is awesome. It certainly made for an interesting story, I’ve always wondered just how you managed to purchase it.